As I prepare my notes for an upcoming speaking engagement, I find myself researching 18th Century Bedgowns. I thought you might be interested in sharing in the information that my research has provided. 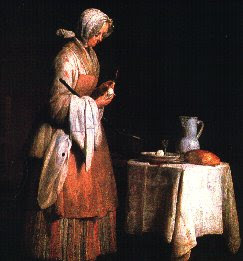 Chardin Painting of a Woman working in her Bedgown. Bedgowns could be worn as undress wear or by the lower to middle class for work and daily activities, as pictured here. The Bedgown is a simple jacket that could be worn as a working woman's everyday garment or by non-working women as an undress garment. 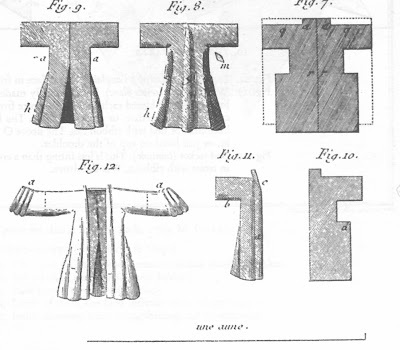 Diderot describes bedgowns as a "kind of short clothing which the women wear the bed, and which they keep in the morning in the fashion of undress." This is the description of an upper class woman's bedgown. He also describes them as made of "cotton cloth more or less fine, of plain or embroidered muslin or other similar material." They could also be made of quilted silk or linen. The bedgown is a loose, unfitted garment, with the sleeves cut in one piece with the body of the garment - there is no shoulder seam. 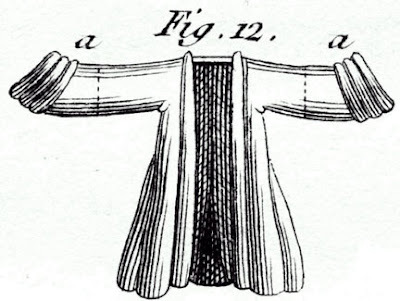 The bedgown falls below the hip in length.